Our up-to-the-minute postgraduate courses combine the best of theory and practice to help equip you for the challenges of the working world. So whatever your future holds: high-flying business leader; paving the way in compassionate patient care; academic research excellence; or ground-breaking discoveries – you can feel safe knowing it’s in our hands. Excellent research is at the heart of what we do. We are a research-driven institution using innovation and creativity to find solutions to real-world problems. Our multidisciplinary research environment is recognised around the world, attracting a strong community of international students to study at Salford. We offer an extensive range of support for postgraduate students. Our postgraduate training programme will help you develop the skills you need for effective research, whether you’re planning a career in academia or the public or private sectors. Our online doctoral programme enables candidates who cannot commit to a full- or part-time degree, to complete their PhD with Salford. We offer a wide range of taught and research master's courses across our academic schools. 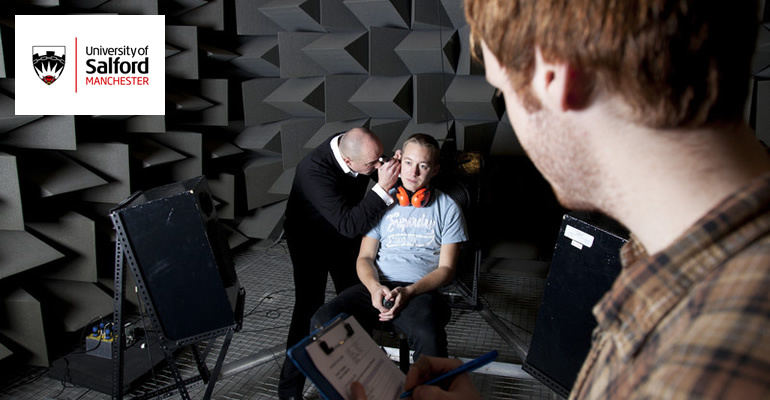 You’ll find industry-standard facilities and pioneering research initiatives across our vibrant campus, including: a world-class human performance laboratory; the world’s only fully climate-controlled Energy House; THINKlab; the School of the Built Environment’s state-of-the-art technology hub, and much more. Tuition fees and funding sources vary depending on the subject you want to study. You can find out more on our website. If you decide to live on campus, you can choose from dedicated postgraduate flats in Peel Park Quarter or Eddie Coleman and John Lester Courts. You can also make arrangements to live in private accommodation. The largest student population in Europe lives in Manchester – so you won’t be short of places to rent. With Manchester on our doorstep and MediaCityUK just a stone’s throw away, The University of Salford is a great place to be a student. Manchester is one of the UK’s most cosmopolitan cities and boasts one of the largest student populations in Europe. Our campus is situated just minutes away from Manchester, so you are close to enjoying everything that this world-class city has to offer. Meet us at one of our open days to find out how our taught courses and research degrees can enhance your career. Our academic tutors will be on hand to discuss your needs, and you can also speak to our team about the application process, accommodation, employability, fees and funding, research support, student life and international visas. Our School of Health and Society is one of the largest trainers of nurses, midwives and allied health professionals in England, and also provides world class education in disciplines such as counselling, social work, sports science and psychology. The school has close links with NHS trusts and bodies such as Health Education England, the Greater Manchester Combined Authority (GMCA), local authorities and the voluntary sector. The work of our researchers includes: ensuring the welfare of children and young people; providing access to housing and fair welfare systems; and transforming the health and social care sector. Our internationally-recognised School of the Built Environment offers accredited courses across architecture and built environment subjects, preparing students for sought-after careers in the built environment industry. As a student, you’ll be taught by leading practitioners and experienced researchers. Our multidisciplinary approach means that you’ll learn alongside students from other built environment disciplines, reflecting real working environments. Your learning environment will extend beyond the classroom, with opportunities for integrated industry experience across the majority of our courses.